2016 brings the beginning of 3 years of ~$50 million dollars worth of infrastructure projects that will transform the AVL Riverfront from Hill Street & Riverside down to Amboy & Lyman with a new roadway, sidewalks, greenways, bike lanes, a visitor center with public bathrooms, some new round-a-bouts, etc.... under the moniker of RAD TIP or the Greater River Arts District Redevelopment so far....here is a map of the plans as of 12/23/16 on the City of Asheville's website. In addition, we hear that RAD LOFTS (~$50 million dollar private development with 200+ apartments, retail & parking deck) goes for its final approval to City Council in January 2017 with hopes to break ground summer 2017. 12 Bones Smokehouse is moving down Lyman Street to behind Riverview Station. The last day open at the original location is January 6th, 2017 and it will re-open February 1, 2017 along side The Wedge Brewery's location #2! find them both @ 5 Foundy Street. 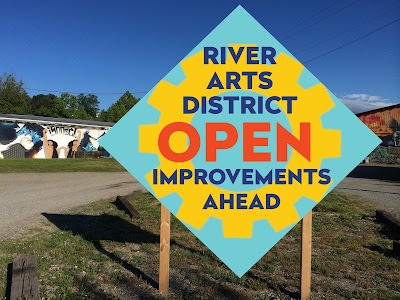 Please welcome North Carolina Glass Center, STEAM Studios, & Cheap Joe's Art Supply, all housed @ River Arts Makerts Place (RAMP) Studios @ 821 Riverside Drive... in what is proving to be an ever expanding River Arts District.